Sound Trip / Film Strip is a work made in the 1970s by Paul Sharits, with the help of Bill Brand. It was restored by the latter and reconstructed as a digital video for the Espace Multimedia Gantner in 2007. On the wall, four projections playing in a loop side by side give us the impression that we are witnessing a group of stable shots. The images are projected vertically, and the perforations of the film are visible at the top of the screen. The images are most often deep pink, but the intensity varies from white to black. The emulsion coating of the film has been exposed to light for different lengths of time, allowing all the intermediary saturation levels of pink to be reached. 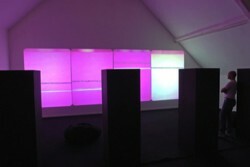 The installation also includes a soundtrack. In what at first seems to be an incomprehensible brouhaha, we can make out four syllables broadcasted equally in a loop and which, put together, make up the word Mis-cell-an-eous. This word, pulled out of its ordinary temporality and detached from its linear structure, appears to be suspended throughout the space. The central theme of the work is time. Time in the process of being made, putting past time and present time in parallel. Time in the process of duration, the small temporal units that are the loops, which nevertheless, by virtue of not being synchronized, never reproduce the initial cycle and construct even greater units, an infinity. Time also in the process of narration, inexistent in structural cinema, which seeks rather to deconstruct cinema, to dismantle/display the cinematographic illusion. These films force the spectator to take a step back from our usual way of seeing a film and to think about a meaning, an interpretation that is sensitive to the moment of the experience. Paul Sharits (1943-1993) was an experimental, avant-garde American film director. He is one of the great figures of structural cinema. 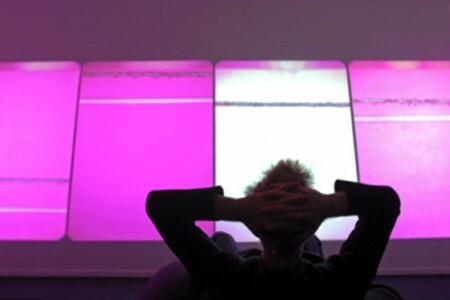 His entire body of work examines the cinematographic apparatus: the film, the photogram, reeling, perforations, the screen, and projections based principally on the “flicker” technique (blinking motifs and colors). He brings the discontinuity of photograms to light, revealing the unsuspected power of montage. Having first studied painting, he privileges pure color, which is omnipresent in his productions.